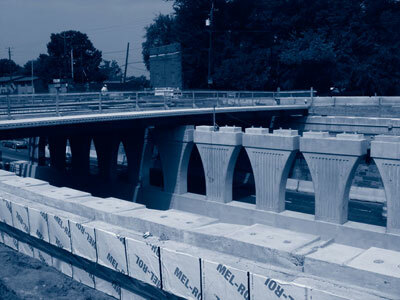 A Washington, D.C., project offered transportation professionals the opportunity to observe the use of innovative accelerated bridge construction techniques to build an urban bridge rapidly and with less disruption to motorists. More than 60 transportation professionals attended a Highways for LIFE showcase to see progress on the project, in which the District Department of Transportation is rebuilding the Eastern Avenue Bridge over Kenilworth Avenue using prefabricated components for the pier and superstructure. A no-excuse completion clause in the project contract is aimed at getting the job done in 320 days, rather than the two years required for traditional construction. The agency developed an innovative traffic management plan to reduce traffic backups during construction. Instead of closing lanes on Kenilworth Avenue, it rerouted traffic onto nearby service lanes. The new bridge is being funded with $9.6 million in American Recovery and Reinvestment Act funds and a $1 million Highways for LIFE grant for innovative approaches to reduce congestion, speed construction and improve safety during construction. "The project combines Recovery Act dollars and innovation to improve our quality of life by creating a safer and stronger community," said Federal Highway Administrator Victor Mendez. "We are helping to deliver transportation projects more quickly and seamlessly, which minimizes daily disruptions." 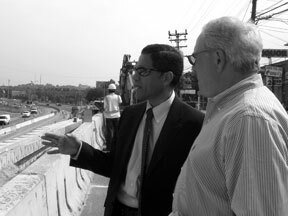 FHWA Administrator Victor Mendez (left) and Butch Marcelle of Fort Miller Co. check progress on a Washington, D.C., bridge project using prefabricated components to speed construction and reduce traffic impact. Mendez and District DOT Director Gabe Klein were among those who made presentations to showcase participants, who represented the Baltimore County Department of Public Works, District DOT, FHWA, National Institute of Standards and Technology, Transportation Research Board and industry. Other presentations covered accelerated bridge construction and Eastern Avenue Bridge project details. Participants visited the construction site to get a closer look at the bridge's precast piers and superstructure and observe the traffic management plan in action. The showcase was part of a Highways for LIFE series that enables transportation stakeholders to observe the use of innovations on actual construction projects. For information on upcoming showcases and presentations from past events, visit www.pdshowcase.org. To learn more about Highways for LIFE demonstration projects, go to www.fhwa.dot.gov/hfl/projects. Interest in the road safety audit, a proactive tool to boost roadway safety, is picking up momentum as transportation professionals learn more about it. "We're seeing great interest around the country in doing road safety audits," said Craig Allred, transportation specialist at the Federal Highway Administration Resource Center. "We're not only seeing interest by the states, but especially also from local agencies and tribal governments. In a few cases the local agencies are leading the states." Every state has participated in RSA training, piloted or performed RSAs, or established an RSA program. A road safety audit, or RSA, can improve the safety of roadway design, construction and operations and reduce the potential for highway deaths and injuries. In an RSA, an independent, multidisciplinary team examines the safety performance of an existing or planned roadway or intersection to identify safety issues. The audit can help produce designs that may reduce the number and severity of crashes, promote awareness of safety and design practices, and cut costs by eliminating potential safety problems. RSAs are a Vanguard Technology, which the Highways for LIFE program is promoting through dedicated teams and proven marketing techniques. The Vanguard Technology initiative is designed to greatly accelerate the widespread adoption of high-payoff innovations to benefit road users. "We'd like to make RSAs a mainstream practice in all transportation and highway agencies across the country, and we've made steady progress toward that goal," said Allred. Workshops have been held in more than 38 states. 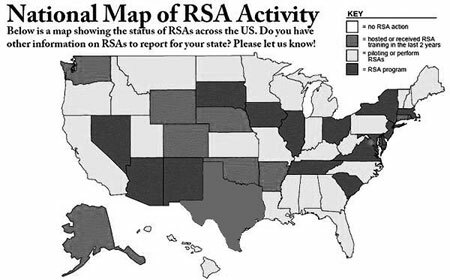 Three states have full-time RSA coordinators. Several states—including Arizona, Delaware, Iowa, Nevada, New Jersey, South Carolina, Tennessee and Virginia—have made RSAs standard procedure, and more are joining that group all the time. All states have received RSA training, piloted or performed RSAs, or have an RSA program. "The overall goal of the program is to decrease serious injuries and fatalities," said Allred. "RSAs are a way to make our roads safer by making sure that safety is not overlooked. The earlier you implement an RSA, the greater is the potential for saving money." Over the past six years, Allred has led more than 300 RSA workshops for representatives of local, tribal, state and federal organizations. "We've even done training in Mexico, Tanzania, and Kuwait, to name a few," said Allred. FHWA works with state and local jurisdictions and tribal governments to integrate RSAs into the project development process for new roads and intersections, and also encourages RSAs on existing roads and intersections. "RSAs are a tool that locals, states and tribes can easily use on all public roads, on any phase of a project, and they are cost- and time-efficient," said Becky Crowe, RSA program manager for FHWA. 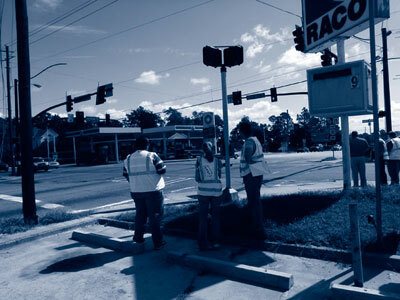 A road safety audit team inspects an intersection in Statesboro, Ga. Examples of safety improvements include pavement markings, signage enhancements, lighting, and chevrons (arrows) to warn of a curve. "Sometimes we see that added law enforcement can enhance the safety of a road in the short term," said Allred. "For example, if you have a big store go into a location, you may need to add law enforcement until you can widen the road or change the signal operation." Allred points to Albany, Ga., as a good example of what RSAs can do. The city performed RSAs on 10 high-crash locations. By implementing the RSA recommendations at all 10, the city was able to remove more than half of them from the high-crash list. In Virginia and Tennessee, the state DOTs will not provide funding for safety improvements unless an RSA is done. And the Louisiana Department of Transportation and Development helps local parishes fund RSAs and the improvements they call for. Arizona has a state coordinator to help local agencies select locations for RSAs, and the coordinator will help the local agency perform the audit. "FHWA has embraced RSAs because their process focuses solely on improving roadway safety," said Crowe. For more information on RSAs, visit http://safety.fhwa.dot.gov/rsa. 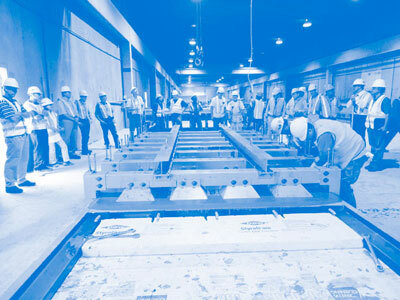 An open house at a manufacturer of full-depth bridge deck panels made of ultra high-performance concrete enabled transportation professionals to observe fabrication of the waffle-shaped panels and discuss their structural performance. Coreslab Structures (Omaha) Inc. received a Highways for LIFE Technology Partnership grant to develop and test the innovative panels. The Technology Partnership program provides incentives to private industry to turn promising technologies into market-ready products that can cut construction congestion and boost highway quality and safety. Highway professionals watched fabrication of an innovative waffle-shaped UHPC slab slated for installation on an Iowa bridge. The two-phase project involves manufacturing, testing and validating the panels and using them on a demonstration bridge project in Wapello County, Iowa. The bridge project is the nation's first to use UHPC, which is more durable than conventional concrete, in modular deck panels. Thirty-six transportation professionals from 11 state highway agencies, academia and industry attended the open house at the Coreslab plant in Bellevue, Neb. They listened to presentations from industry, university and highway agency representatives on the bridge project, UHPC production process, and waffle slab research and testing process. The open house participants observed fabrication of one of the deck panels that will be installed in the Iowa demonstration bridge. The panels are designed with a waffle shape that reduces the volume of UHPC needed and the associated cost. They watched as the UHPC was mixed and placed in the form. Afterward, they looked over a UHPC waffle panel piece that had been made previously. "This event provided a hands-on experience with UHPC," said Ben Graybeal, manager of FHWA's structural concrete research program. "Seeing UHPC mixing and fabrication in person and viewing how it is feasible to use this material within the framework of existing infrastructure-related concrete mixing and casting operations was quite valuable to all who attended." 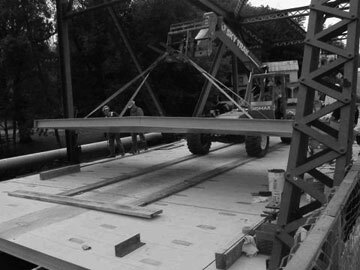 In the first phase of the Technology Partnership-sponsored project, two prefabricated full-depth UHPC waffle deck panels were connected to precast girders and the system was tested under service, fatigue and ultimate loads by an Iowa State University research team. Results of the tests indicated that "the panels performed very well and appear to be capable of holding up well to the rigors of use on a public highway," according to a report on the project's first phase. The project's second phase, beginning in fall 2010, includes construction of the demonstration bridge in Iowa and a life cycle cost analysis of the project. To view the phase I report on the Coreslab project and a video on waffle slab fabrication, go to www.fhwa.dot.gov/hfl/partnerships/bridgetech.cfm. A key benefit of conducting market research before implementing transportation innovations is that it can provide information that reduces risk, according to speakers at a Federal Highway Administration Web conference. "Each innovative practice or technology we put forward is a commitment of hundreds of hours of staff time and thousands or even millions of dollars, so we want our decisions to be based on accurate information, not just what we think may be the case," said Kathleen Bergeron, marketing specialist for the Highways for LIFE program, who moderated the session on market research for innovations. 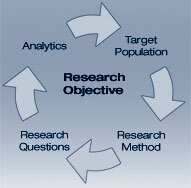 The research objective determines audiences to target, methods to use, questions to ask and uses of the results. Typically, highway agencies use market research to measure customer satisfaction, drive decision-making and gauge support for initiatives such as fuel tax increases. But market research can also generate information to make technology deployment efforts more effective. "Good market research can help you decide how best to go about deploying the technology, such as determining what sort of promotional efforts to use," Bergeron said. The transportation industry trend is toward more innovation deployment, she added. FHWA initiatives involving innovation include Highways for LIFE, which promotes the use of proven innovations to build better-quality highways faster, more safely and with less impact on motorists, and Every Day Counts, which is aimed at accelerating the mainstreaming of innovation and shortening highway project delivery time. In addition, the second Strategic Highway Research Program focuses on innovations that advance highway performance and highway user safety. One of the most important steps in the market research process is determining the research problem or need, Mia Zmud, a NuStats director, told Web conference participants. "Otherwise, you'll spend time formulating a research plan without an end goal," she said. "You may end up with data that doesn't meet your needs." Having a clear market research objective helps define the elements of the research plan, including target audiences, the best ways to collect information from them, what data are needed and how results will be used. Research methods include qualitative—such as focus groups and in-depth interviews—and quantitative—such as telephone and mail surveys. "Qualitative research provides insights and understanding of the research problem," said Zmud. "You'll want to consider quantitative research for research that needs hard numbers or a point-in-time measure of something—customer satisfaction, support of a new program, or perception of the need for a program or product innovation." After the research is conducted, it's important to put the data to use, she said. "If you've defined the research objective, matched the research method to the need and conducted high-quality data collection, you should end up with data that will be useful and meaningful. The worst thing is to have research sit on a shelf and get dusty." John Cashmore, vice president of Ascendancy Research, described new trends in marketing research, including conducting focus groups online and using social media and smart phones for surveys. "Electronic data collection has augmented traditional data collection methods, but it has not replaced out-bound telephone, mail, traditional focus groups, etc. They must be used in concert in most cases," he said. Researchers also are increasing their use of hybrid methods for data collection and analysis, combining secondary, or already-published, research with qualitative or quantitative methods. "One method doesn't fit all," said Cashmore. Accelerated bridge construction techniques are helping complete the D.C. project in less than half the time traditional methods would take. The Minnesota Department of Transportation, which started doing in-house market research in 1994, uses it to ensure that what the agency delivers meets citizens' needs, according to Chris McMahon, director of market research. A key to success is having top-level champions who support the research effort. "It's critical to get buy-in from leaders," McMahon said. The agency conducts several ongoing tracking studies, including customer surveys on snow removal and congestion management. It also studies specific issues, such as the survey it conducted to measure support for two scenarios for rebuilding Highway 36 in North St. Paul: closing the road completely for five months or keeping it open with delays and off-peak closures for two years. When survey results found no clear preference for either scenario, the agency decided to use the full-closure technique on the project, which received a Highways for LIFE grant to try the innovation. A post-construction survey showed strong approval for the full-closure decision. For more information on market research for innovations, contact Julie Zirlin at (202) 366-9105 or Julie.Zirlin@dot.gov. The newest addition to the Highways for LIFE website is a collection of Spotlight videos on innovations that enhance highway safety and quality and reduce construction congestion. The two- to four-minute videos, which can be viewed at www.fhwa.dot.gov/hfl/resources, are designed to provide an overview of each innovation, examples of where it's being used and resources to learn more about it. "We've designed the Spotlight videos to introduce key innovations in a quick, easily accessible manner. Our goal is to create awareness of these useful technologies and stimulate interest in learning more," said Kathleen Bergeron, marketing specialist for the Highways for LIFE program. More videos are in the works and will be added to the website in the coming months. An interlaboratory study conducted with the help of a Federal Highway Administration Technology Partnership grant confirmed the accuracy and usability of a device to pinpoint the temperature at which asphalt binder will crack. Cold temperatures can cause asphalt pavements to crack if the right type of asphalt binder isn't used for the climate. That can lead to premature deterioration of a roadway and create the need for costly, congestion-causing repairs. Asphalt binder is poured around the ring then cooled to a very low temperatures in a controlled manner. The Asphalt Binder Cracking Device, or ABCD, uses a simple, reliable method to determine the susceptibility of various binders to thermal cracking before they are used on paving projects. Highways for LIFE provided a grant under its Technology Partnership program to help EZ Asphalt Technology LLC of Athens, Ohio, develop and evaluate the ABCD. The first phase of testing involved conducting a field validation of the ABCD and refining the equipment and analysis software. In the second phase, 31 laboratories participated in a study to evaluate the repeatability, accuracy and simplicity of the testing system. The volunteers included 18 state and federal government labs, one Superpave Center, one Canadian Ministry of Transportation lab, five universities, and six private facilities. Technicians at each lab set up the ABCD testing system and conducted a series of three test runs on three sets of asphalt binder specimens. Despite limited experience using the device, all of the participating labs were able to complete the tests successfully. Results of the tests showed that the standard deviation of the temperature was within an acceptable range of precision. Ten labs also conducted a Bending Beam Rheometer test, a more traditional test for low-temperature properties, on the asphalt binder samples. The results indicated that the precision estimates of ABCD cracking temperature and BBR critical temperature were comparable. Users provided feedback on their ABCD testing experience, which was used to further refine the test procedure. Several reported that trimming the poured asphalt sample was difficult, so the test procedure was simplified to eliminate that step without affecting the test's accuracy. 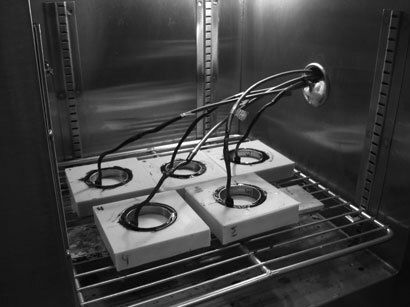 "Most labs reported that ABCD was an easy test to run," said Dr. Sang-Soo Kim, owner of EZ Asphalt and associate professor of civil engineering at Ohio University, who developed the device. "Engineers and technicians liked the fact that they could see the performance of the tested binder directly without additional analysis." Unlike conventional test methods, the ABCD creates thermal cracking conditions similar to those in the field. It consists of a metal ring equipped with temperature and strain gauges that fits into a silicone mold. Heated asphalt binder is poured around the ring and the device is cooled. As the temperature falls, the asphalt binder contracts more than the metal ring, causing the binder to fracture. A computerized data acquisition system captures the temperature and stress level at which the fracture occurs. That information can be used to grade asphalt binders for expected climate conditions, as well as to develop new binders that can better withstand cold temperatures. The American Association of State Highway and Transportation Officials is reviewing the ABCD test procedure and considering making it a provisional standard, the first step toward final adoption as a standard. Meanwhile, EZ Asphalt plans to develop a range of ABCD models to satisfy industry's different needs. "Thermal cracking is a significant and costly problem. Highways for LIFE helped transform ABCD from a research tool to a problem-solving tool that can be used in real life," said Kim. "We plan to address the feedback of the participating labs, and we already have significantly refined the test equipment and procedures." For more information on Technology Partnerships, visit www.fhwa.dot.gov/hfl/partnerships or contact Julie Zirlin at Julie.Zirlin@dot.gov or (202) 366-9105. For details on ABCD, go to www.ezasphalttechnology.com or contact Sang-Soo Kim at (740) 597-3230 or skim@ezasphalttechnology.com. Recent field trial projects show that bridges using fiber-reinforced polymer composites can be built faster, have the potential to last longer, and can be cost-competitive with conventional concrete and steel bridges. FRP composites were used for the deck of a bridge on NY 418 over the Schroon River. Those are among the benefits that emerged for FRP composites during a recent Web conference sponsored by Highways for LIFE in partnership with the National Highway Institute. The two have teamed up to provide "Innovations," a monthly Web conference series that is free to participants. For more, visit www.nhi.fhwa.dot.gov/about/innovationseries.aspx. FRP composites are not new, said Lou Triandafilou, senior structural engineer at the Federal Highway Administration Resource Center. FHWA sponsored a great deal of research on FRP composites in the 1980s and 1990s. A group of industry leaders conducted an International Technology Scanning Program study almost 15 years ago, looked at 29 FRP projects in Europe and Japan, brought the technology back to the United States and developed an implementation strategy to encourage the U.S. transportation community to adopt the technology. Rigidified FRP tube arches, also known as a "bridge-in-a-backpack," offer a lightweight advantage over other bridge types in environmentally sensitive areas where it is not feasible to bring in heavy equipment. FRP tube arches are essentially inflatable stay-in-place tube forms that are filled with concrete and used as arches to support the bridge. The FRP acts as structural encapsulation for the concrete, reduces construction time and labor, and eliminates corrosion problems that arise with steel, said Dan Bannon, structural engineer with Advanced Infrastructure Technologies. At the Neal Bridge replacement project in Maine, for example, 23 FRP composite arches were installed in one day in fall 2008. The tube arches were filled with self-consolidating concrete and corrugated FRP decking was screwed over the top. Headwalls were built of FRP composite material as well. In fact, the superstructure was built in less than two weeks. "That was our pilot project and it was reported as cost-competitive, which was very promising for us," said Bannon. A second bridge, the McGee Bridge replacement project in North Anson, Maine, was built with nine FRP composite arches in just 12 days, and that included demolition of the old bridge. FRP composite arch bridges have a lower carbon footprint than concrete bridges because they use less cement. "We estimate that 20 percent of U.S. bridges could be candidates for FRP composite arches," Bannon said. "And now we're looking at 15 new projects in multiple states and other countries." Hybrid composite beams, or HCBs, combine the best properties of concrete, steel and FRP composites in beam fabrication, said John Hillman, senior associate at the Teng Associates engineering firm. The HCB is a structural member consisting of an FRP shell filled with concrete to form a compression arch. Tension reinforcement consisting of galvanized strand is installed across the bottom of the beam and encased in self-consolidating concrete. "We're looking at 100-plus-year life for these members, and they are corrosion resistant," said Hillman. "We use a minimum amount of concrete, just enough to get stiffness. These members are lightweight—just 10 percent of the weight of concrete. They're safe, because they consistently exceed code requirements. And they reduce the carbon footprint because less cement is used." Hillman cited examples of four bridges built using hybrid composite beams. At the Route 23 bridge in New Jersey, for example, six beams were placed and filled with concrete in just six hours. The bridge span was 31 feet (9.4 meters), and each HCB plank weighed just 2,000 pounds. "We're designing HCB bridges with spans of 100 feet [30.4 meters]," said Hillman. "We've already done 70 feet [21.3 meters], and that works." Besides bridges, he says other uses of HCBs include piers, wharves, beams, planks, and roofs—virtually anywhere concrete or steel beams are used. For more information on FRP composite bridge technology, visit www.fhwa.dot.gov/bridge.